Culligan offers a variety of soft water options for every buyer and every budget. Remember, your local Culligan expert serving Central Coast and surrounding communities offers a complete line of proven technologies for every application while other some companies are quick to offer unproven solutions like descaler-gadgets or “magic beads”. Start with a free water test today and allow a Culligan representative to review all of your options in the comfort of your home. Even better, Culligan offers convenient rental programs in addition to buying the system of your choice. 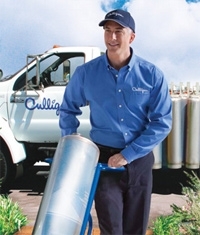 Your local Culligan Man simply delivers and exchanges a tank at your home on a regular schedule. Regeneration takes place at Culligan, so there’s no salt or discharge at your home. * Contaminants are not necessarily in your water. An easy solution to soft water, Culligan self-regenerating water softening systems operate just as efficiently using potassium chloride as an alternative. And don’t rely exclusively on your local Culligan dealer for the facts. Culligan, serving Central Coast and the surrounding communities, suggests your look at independent research to make sure you’re making the right choice. For your convenience, we’ve included links to several 3rd party studies for your review. WQA determined no performance test standard for Physical Treatment Devices exists in the US for “Salt Free” devices. Some scale control devices may partially reduce scaling, but none of these products have been tested to any U.S. national testing standard or certification. None of these products produce soft water. Purdue University tested 6 unidentified magnetic water conditioning devices and compared them to untreated water. Testing lasted for 240 days. No beneficial effect was seen for the magnetic treatment devices. South Dakota School of Mines & Technology tested two different classes of magnetic water treatment devices. Measurements included boiling point depression, surface tension, water conductivity and “scaling Rate”. No difference seen between raw water and the water treated by magnets. U.S. Army Corp of Engineers tested two magnetic and one electronic device in 2000. The findings do not support the claims of the manufacturers regarding the ability of their respective devices to prevent mineral scale formation. Penn State University states there is virtually no valid scientific data to support any water treatment benefit from magnetic devices. Although companies use testimonials from “hundreds of satisfied customers” to support their claims, the claims put forth by manufacturers and sales representatives of this devices are without validity. Culligan firmly believes that knowledgeable consumers are our best customers!